AJ Saclyn, Ashley Holland, and Angie Rushe from Restek and Sarah Mewhirter from the Red Cross, work together to support relief efforts. BELLEFONTE — Restek, its employee-owners, and its customers teamed up to give more than $5,000 this November in support of the Red Cross hurricane disaster relief efforts — particularly in areas affected by hurricanes Florence and Michael, which ravaged the southeastern United States. Both monetary and blood donations provided support to those in need, according to a press release. Bryan Wolcott, Restek President and Head Coach, thanked customers and coworkers for their kindness and charity. For several weeks this fall, customers could pay it forward by converting their Wizard Dollar frequent buyer incentives to cash donations for those in need. Restek employees also offered their own Wizard Dollars, and the company matched every dollar contributed. Similar collection drives were implemented in recent years in response to other natural disasters. Many of the programs are set into motion by Restek employee-owners who have talked to customers or family members in the areas and know how much help is needed. Restek is well-known for empowering its employees to come up with ideas to support the local communities in which they operate. 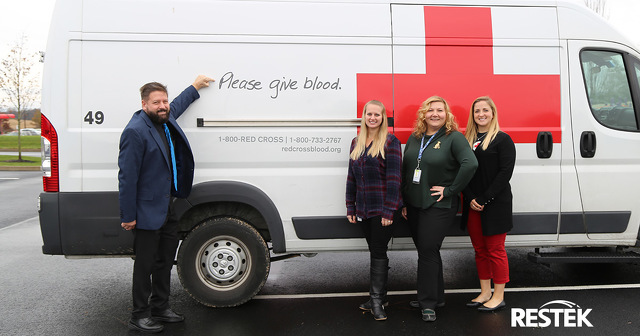 In addition to the monetary donation, employee-owners stepped up to fight the severe blood shortage through another successful blood drive on Nov. 13. According to the Red Cross, fewer blood drives hosted in September and October, coupled with the widespread cancellation of scheduled drives as a result of hurricanes Michael and Florence, have led to the current blood shortage. Restek’s drive collected 33 units—saving an estimated 99 lives! This is the continuation of a long history of blood drives at Restek—bimonthly for the last 16 years—making them Centre County’s leading business blood drive sponsor.